And don't even get me started on the tree. It has absolutely no regard for the ever-so-careful way that you just threw it into it's crumbling box last January. All those wasted minutes trying to cram everything back into place before giving up and copiously taping it closed with left-over rolls of cellophane tape in the hope that it wouldn't explode once you toss it into the basement corner of forgotten magic. That tree does NOT care. You know how much it doesn't care? It went and lost itself. That's how much. And now you've got crying children because they can't find the "F" branches and everyone knows you can't move on to the "G" branches until you've added the "F" branches. And now they will NEVER get to fight over who gets to put up the snowman with the pink hat ornament that actually broke last year and you hid it in the garbage when no one was looking because really, that's a conversation that was NOT going to end well for anyone involved. Especially you. 1. Use skin color icing to outline a circle for the face. Fill in and smooth out if necessary. Let dry for an hour. 2. 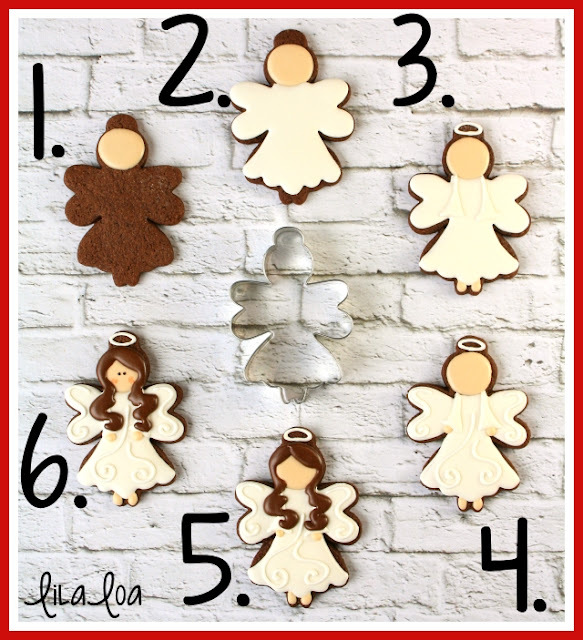 Grab some medium consistency white icing and pipe the dress and wings. Let dry for 15 minutes. 3. Pipe the sleeves with the white icing. Pipe the halo with the same icing. Pipe two dots of skin color icing for feet. Let dry for another 15 minutes. 4. Add swirl details to the wings and dress. Pipe two dots of skin color icing for hands. Let dry for an hour. 5. Add wild tresses of gorgeous hair with brown icing and a #2 tip. 6. Use a black food color marker to make eyes. Give her rosy cheeks with a pink food color marker. 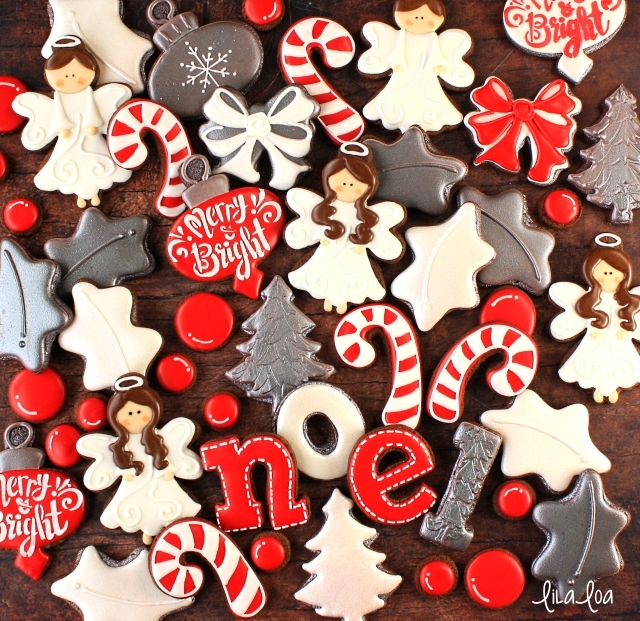 Grab the cutters: ANGEL, CANDY CANE, LETTERS, BOW, and ORNAMENT. Get the supplies: Tree Stencil, Merry and Bright Stencil, Black Food Color Marker, and Pink Food Color Marker. Get the tutorial for the EASIEST CANDY CANE COOKIES EVER!! See how I used the same cutter to make a SUGAR PLUM FAIRY.